Hyderabad and Noida, four Currency / Security presses at Nashik, Dewas and Hyderabad, a high quality Paper manufacturing mill at Hoshangabad and Currency Paper manufacturing Unit at Hoshangabad. Total declared Officers vacancies are 28. Online application process starts from 03-12-2018 to 03-01-2019. Company will select candidates by conducting skill test and followed by online test. CNP Officers Jobs Written Exam will be conducted in the months of February 2019 in selected centers only. 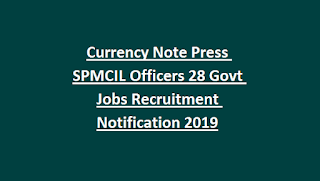 Category wise Vacancies, Eligibility criteria, Age Limits, Qualifications, Selection process, Exam pattern and other information of Currency Note Press, Officers Jobs Recruitment details are given below. Opening date of Online application process: 03-12-2018. Closing date of online application procedure: 03-01-2019. Online Application fee payment: 03-12-2018 to 03-01-2019. 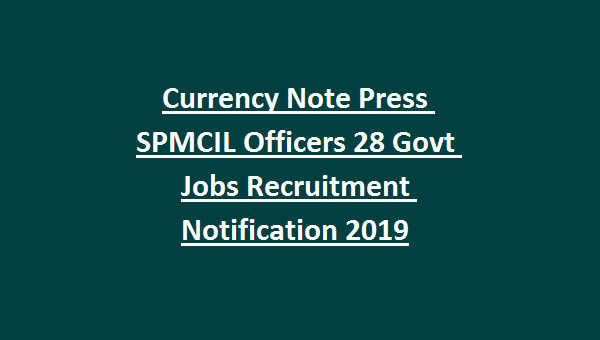 Total 28 Officers vacancies in CNP Nashik recruitment. Officers Materials-Engineering Degree in Mechanical/Electrical/Electronics/Pulp & Paper Technology or Printing with PG. Age limit of the candidate as on 31-12-2018 should be 18 years to 30 years. Upper age relaxation for SC/ ST is up to 5 years, for OBC is 03 years. Other details regarding Upper Age Relaxation refer CNP’s Advertisement. Monthly Pay scale in CNP Supervisor recruitment is Rs. 16400/- to Rs.40500/-. Candidates are required to pay Application fee of Rs. 400/- through online payment by 03-01-2019. No Application fee for the candidates under SC/ ST/ PWD/ Ex- Servicemen category. The selection process for the Officers Jobs of Currency Note Press will be based on online Test. Online Examination will consists of 5 topics. Total exam will be conducted for 150 marks and 120 questions will be given and exam duration is 120 minutes. Skill Test and Online Test will be held on February 2019. Applicants are advised to visit company’s website for exact date of skill test and online examination. Applicants who are Interested/ eligible for this job can get the application link from company’s official website http://cnpnashik.spmcil.com . Open the link and fill the details of application carefully. Online application procedure starts from 03-12-2018 to 03-01-2019. They said in notification the same date..
U have check in Careers Section top on top of official website.